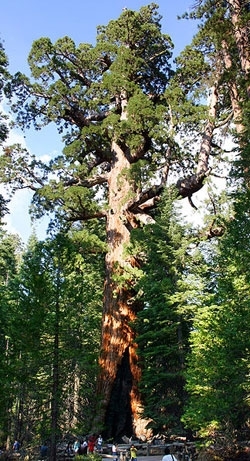 The giant sequoias of the Sierra Nevada are the biggest and among the oldest trees on the planet. Some are 2,000 to 3,000 years old. Forestry scientists from the University of California and Cal Poly, San Luis Obispo, want to learn more about how disturbance factors affect the health of these aging behemoths. Growth-response studies to date show that tree vigor can increase following moderate intensity disturbances such as prescribed fire or mechanical fire-hazard reduction treatments. Less certain, however, is how giant sequoias respond to lower and higher intensity disturbances. This information is of critical importance to identify the tradeoffs involved in fire prevention treatments or evaluating management options. This summer scientists will visit native groves within Giant Sequoia National Monument, where high-intensity disturbances occurred 20 years ago. Harvests conducted at that time removed all trees except for large giant sequoia, creating a forest structure similar to what you’d expect after a high-intensity wildfire. Following the harvests, there was considerable public concern over the fate of the giant sequoias remaining. Mortality and growth in these areas has not been assessed until now. The primary investigator on the project is Robert York, station manager of the UC Center for Forestry and an adjunct professor in the UC Berkeley Department of Environmental Science, Policy and Management. York is an expert in giant sequoia ecology. His co-investigator on the project is Scott Sink, a professor in the Department of Natural Resources at Cal Poly, San Luis Obispo. He has investigated differences between old growth and secondary forests and developed expertise in measurements of tree ring growth. The researchers will partner with forest ecologist Steve Hanna of Giant Sequoia National Monument in Porterville. 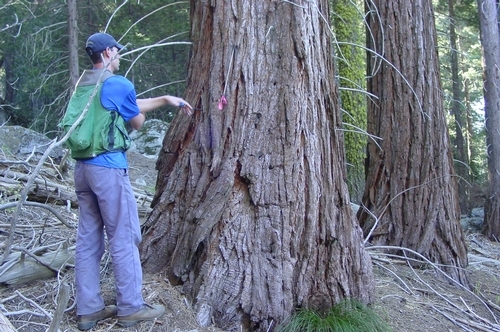 The scientists will also study tree ring widths taken from 33 giant sequoias at the UC-Whitaker Forest, where light burns and small tree removal occurred in 1967. York previously conducted field work on growth response in a giant sequoia forest subjected to a moderate-intensity disturbance. In addition to publishing a journal article on this work, researchers will hold a field trip for managers of giant sequoia groves, involve UC and CSU students in field and laboratory work, and develop a lab module for coursework at UC Berkeley. Very cool trees! Someday I plan to see them. These studies are potentially critical to the future of these wonderful and amazing trees. I appreciate the fact that UC Berkeley has taken an interest in them. I only wish I was involved in the research.